The Lord knows those who are His. True believers are His and He knows them. We all know there are some on this earth who say they are believers or profess to be Christians, but truly aren’t—they may fool everyone here on earth, but they don’t fool the Lord. He knows who are His. 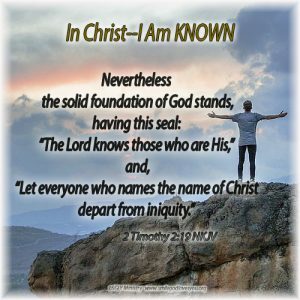 And that is why this verse says “Let everyone who names the name of Christ depart from iniquity”, for those who say they are Christians and aren’t are doing themselves and God a great injustice and are really living in offense to the gospel. We who are true believers, can be confident that we are known by the Lord , even if sometimes we feel unknown or insignificant in this world, we can always be sure that the Lord sees us and knows us. Therefore, give thanks today if you are a true believer in Christ who stands on the solid foundation of God, for you are sealed with the Holy Spirit and the Lord knows you are His.